SYDNEY’S Jewish Remembrance Day service is always deeply moving, but it held even more resonance in its latest chapter at the Sydney Jewish Museum last Sunday – almost 100 years to the day since the guns fell silent at the end of World War I, and 95 years since General Sir John Monash officially opened the NSW Jewish War Memorial. JEWISH history was made in our nation's capital last Sunday when Governor-General Sir Peter Cosgrove officially unveiled the first ever Australian Jewish War Memorial (AJWM), which commemorates all 341 Jewish Diggers who are known to have died on active service for their country from 1900 to today. Eleven Indigenous participants of the Rona Tranby Trust's Australian Light Horse Project, who participated in last October's re-enactment of the Battle of Beersheba centenary commemoration, were honoured at a reception at Sydney's Government House late last month. THE dedication ceremony of the new Australian Jewish War Memorial in Canberra will be held on Sunday, August 12 to coincide with the commemoration of the Centenary of General Sir John Monash's knighthood, the ACT Jewish Community's secretary Dr Merrilyn Sernack has announced. A section devoted to telling the stories of some of the almost 1600 Australian Jewish men and women who served in the Great War is being included in the Spirit of Anzac Centenary Experience, which will be on at Sydney’s International Convention Centre from April 15-27. Australia's oldest synagogue proved a fitting venue to host a ceremony that was 100 years in the making for Tasmanian Jewry. MORE than 3000 people stood at Pheasant Wood Military Cemetery near Fromelles, France, last week to honour the Diggers who died exactly 100 years ago. THERE could not have been a more fitting venue than The Great Synagogue to remember the sacrifices made by Jewish servicemen and women in defence of their country. 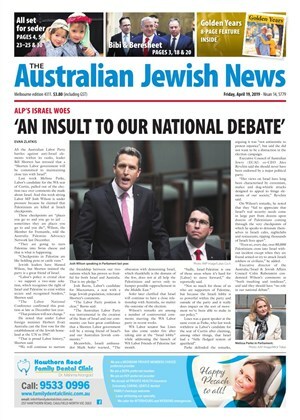 THE NSW government has provided over $16,000 in funding to the Jewish community for its activities commemorating the Centenary of Anzac this year. Do you know these Diggers? 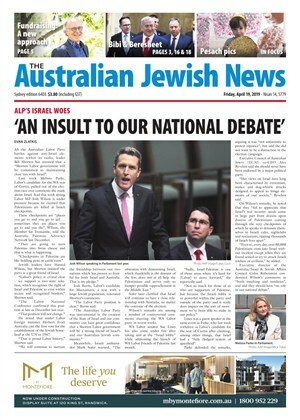 WITH the Centenary of Anzac fast approaching, the Australian Jewish Historical Society (AJHS) needs your help.